On Zingura Play app you can predict the outcomes of certain events in sports matches and win paytm cash. The app is owned by Trizin Infotech Pvt. Ltd. which was registered on 25 July 2017 with an authorized capital of Rs. 10 lakh. The Zingura Play app appears to be safe and legitimate on the surface. But is it? You’re gonna see a lot of ‘Zings’ in this review so it would be better to know what zings are beforehand. Zings are in-app virtual currency of Zingura app. 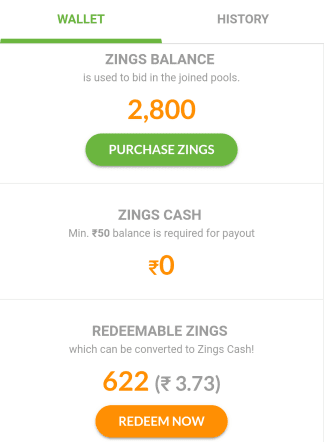 You can use Zings to bid on matches and redeem them for cash. Getting started with the app is pretty simple and quick. The sign-up process only takes 2 minutes. All you need to do is enter your number, name and referral code- HIM9700(to get 3000 zings). You will get 3,000 Zings as a starter pack which can be used make predictions/bids. 1. Pick a sport and a match within that sport. You can only predict for those matches that are scheduled for the day. 2. After selecting a match you can see various pools that you can join and bid. Each pool has an entry fee in zings. Tap the pool that you want to join and confirm the payment. 3. The fee(zings) that you paid to join the pool will now be shown as the zings that you can use to bid on predictions. You can either use the available zings in one bid or divide it across different bids. Once you have made a bid you can’t change it. The bid amount placed of 1500 zings will be sent back to your Zings Account Balance, and win-profit of 2400 zings will be available on your My Bids Page. Results are announced separately for each pool. Once the match is over, and the results are announced, bids won and win profit will be visible. When you invite your friends and they sign up with your referral code they will get 3,000 zings and you will get Rs. 3(first level). You will also earn from the referrals that your invited friends invite. ZinguraPlay has a 4 level referral system. You can convert the Redeemable Zings to cash and redeem the amount to your Paytm wallet. Minimum Payout is Rs. 50. Zingura Play is a fairly new app. There aren’t many user reviews available online to draw any conclusions. I just started using the app so I haven’t won enough zings to redeem. So, I’ll put this app under surveillance. Will update this review when I discover anything new.